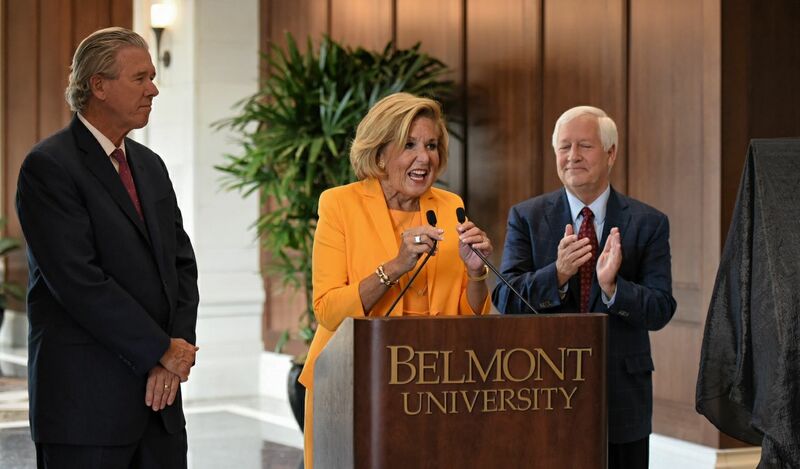 In a ceremony held today, Belmont University unveiled a plaque honoring Nashville business executive and Belmont Trustee Cordia Harrington in the newly named Harrington Place Dining, a 950-seat cafeteria that fills the second floor in the new R. Milton and Denice Johnson Center that opened last fall. Harrington is being honored for her longtime support for, and generosity to, the University. Harrington’s dedication to Belmont and its students is apparent through her role on the Belmont University Board of Trustees Executive Committee and her establishment several years ago of “The Bun Lady Scholarship,” which is awarded annually to entrepreneurship students who are participating in Belmont’s study abroad programs. More recently, she added the “Harrington Scholarship for International Studies and Student Missions,” which provides need-based scholarship support for students incurring expenses related to international studies or Belmont-sanctioned mission trips. Additionally, Harrington is a frequent guest speaker in both graduate and undergraduate business classes, and two of her and husband Tom’s five children—Hunter and Tyler Wilkinson—are graduates of Belmont. Harrington is founder and CEO of the The Bakery Cos. which laterally integrated business units include transportation and cold storage companies and grew sales from $4.8 million to more than $100 million. In addition to Cordia and Tom, sons Hunter, Brad and Tyler Wilkinson along with daughter Beth Westjohn are all involved in the family business. Active in the community, Harrington serves on several boards including Bank of Nashville, American Bakers Association, Nashville Entrepreneur Center and Zoës Kitchen, and also supports 17 Ronald McDonald House Charities. Harrington’s vast achievements have brought significant recognition, including receiving McDonald’s Corp. Leadership Award (2014), Nashville Business Journal’s Most Admired CEO (2015) and Beta Gamma Sigma Entrepreneur of the Year (2012), among numerous other awards.